/ The 4 best swimming snorkels in 2019, and reasons why you’ll want one! Snorkel use has exploded among competitive and recreational swimmers. 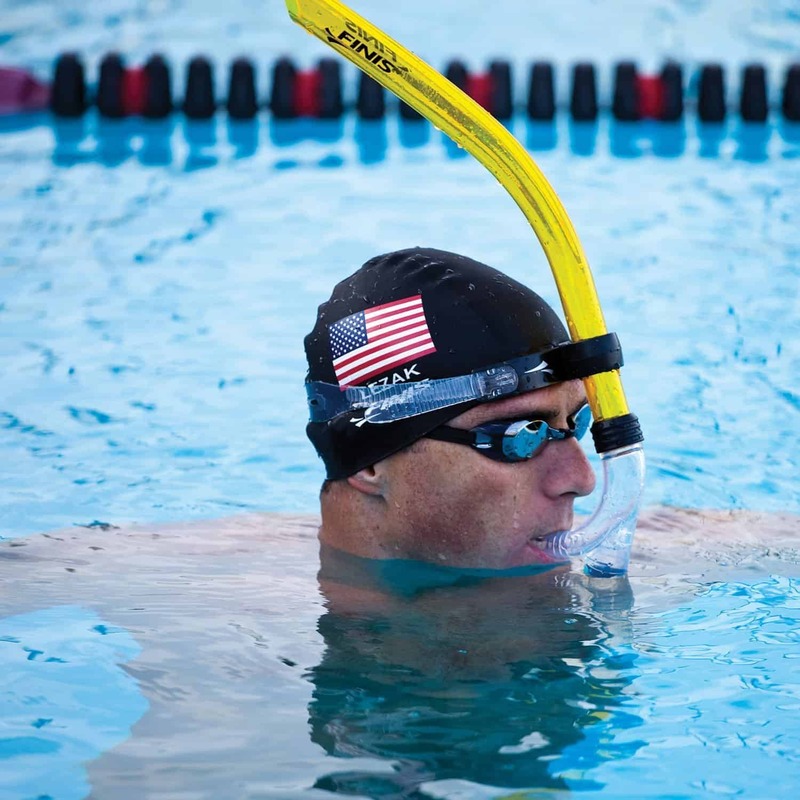 Center mounted swim snorkels are improving techniques and times of swimmers for both endurance swimming and competitive swimming. These can take a little getting used to, but the benefits of training with one will quickly show. ​Within this article we point out the things to look for when buying one that suits you and and swimming style. There's also tips on how to keep it hygienically clean. Click on the line below to take you to the answer of your most pressing, or continue scrolling to read the entire review. Do you need a center-mount swim snorkel? With a center-mounted snorkel, swimmers are able to breathe while keeping their head in the water. 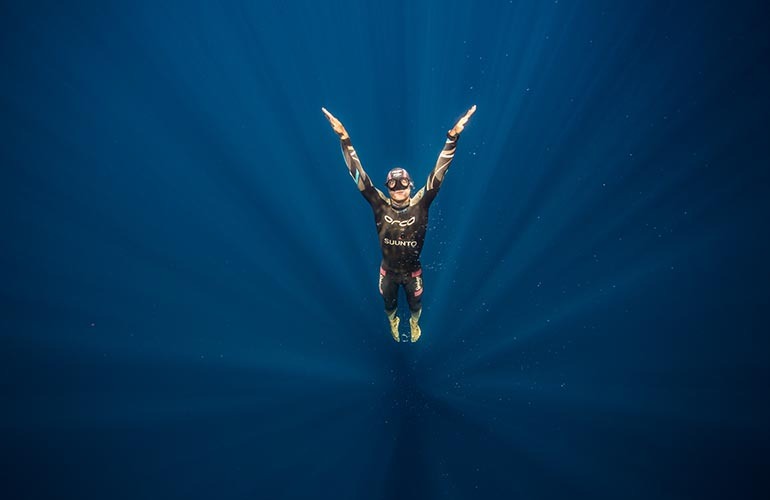 By eliminating the need to turn the head to breathe, swimmers start to relax more in the water, and are able to concentrate on maintaining their body alignment and improving their stroke technique. This then improves stroke efficiency, helps build aerobic capacity, and leads to improved swim times. 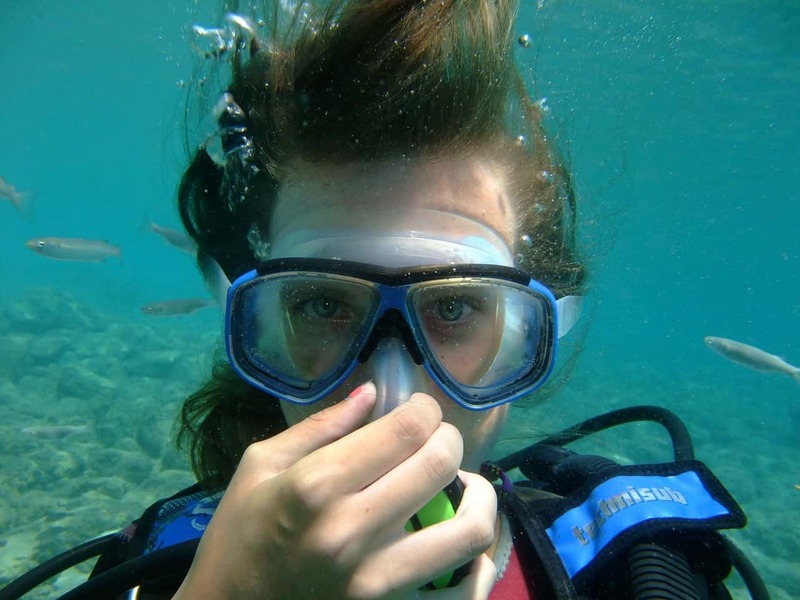 A snorkel can help correct a wandering head and reinforce a straight-line from the top of the head through to the ankles. Swimming with a more relaxed head position, relaxes the neck and shoulder muscles and can help lengthen swim practice sessions. The center-mount design accommodates a full range of motion for butterfly, breaststroke and freestyle. It stays in place even for flip turns. Snorkels come in many styles, sizes, and colors. Swimming snorkels have different training features so it's important to get the one that suits your current needs. Finding the right length, shape and diameter of the snorkel tube is important. The size and construction of the headpiece is also important when choosing a snorkel. Always make sure the mouth piece is made from a flexible medical grade silicone. Some designs come with a one-way purge valve to allow water to flow out of the tube without entering the mouth piece. Hydrodynamic shaped tubes curve around the head to reduce drag in the water. 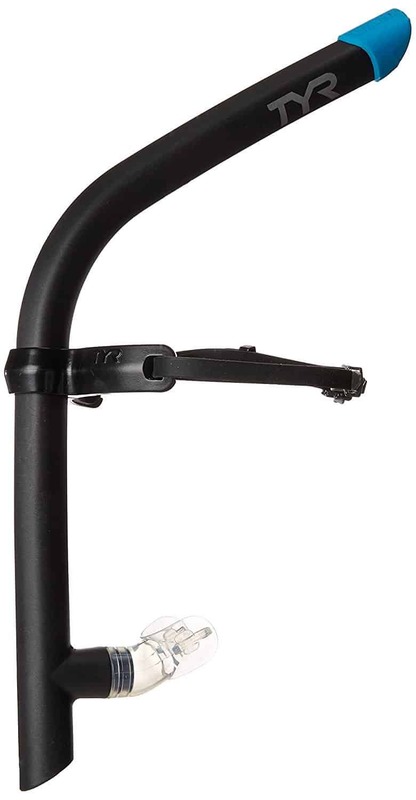 Look for snorkels with adjustable head brackets, and ones that give quick strap adjustments. Swim snorkels with a larger diameter spout are great for beginners or open water swimmers who need a greater oxygen flow. Open water swimmers typically benefit from snorkels with longer tubes as these are better at preventing water from entering, helping them to break through choppy water and high swells. If you're buying for children or beginner swimmers, you'll want a snorkel with a shorter spout, as these are easier to control. Also look for ones with some extra padding as it offers a bit more comfort. 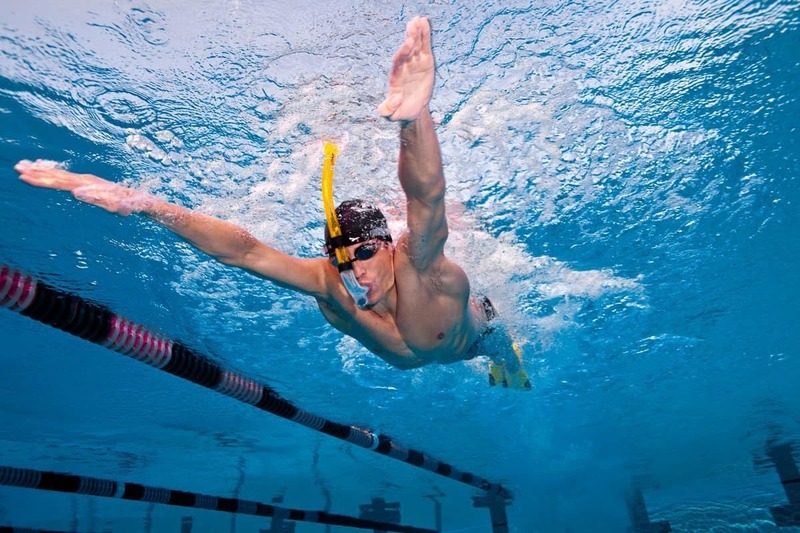 Curved snorkels are great for anyone working on specific stroke technique such as Freestyle or Breast Stroke, and long distance swimmers. The curved tube shape fits around the shape of the swimmers head, creates less drag, and reduces water entry on flip turns. This design lets the swimmer concentrate on their technique and takes away the worry of swallowing water when diving forward during the glide portion of each stroke. Long distance swimmers should also look for a snorkel that has good padding for extra comfort. Experienced adult swimmers or anyone focusing on hypoxic training may what to look at snorkels with air restricting caps. There are snorkels that come with two air restriction end caps pieces. Be sure to pay attention to the strap construction. Head size and personal preferences will determine which strap style is most comfortable. Some snorkels have additional padding on the head piece. This extra cushion is great for younger swimmers, long distance athletes, and anyone looking for more comfort. Swimming snorkels has become a standard piece of gear for competitive swimmers. Here's some tips for first time users of snorkels to get you started and make sure you're using the snorkel correctly. Children and beginners to the snorkel can initially find it difficult to breath only through their mouth. Water can be inhaled through the nose, so wearing a nose clip to help encourage the practice of only inhaling through the mouth. Before swimming with the snorkel for the first time, place your face in the water and breathe through the snorkel to get comfortable. Make sure there's a good seal around the mouthpiece. Although you don't want your mouth to be too relaxed, you also don't want to bite down too hard on the mouthpiece. This can cause the mouthpiece to wear out faster than normal and also cause a sore jaw. Not all snorkels have purge valves but if yours does, then you need to practice purging the snorkel before commencing to swim. Take and hold a breath, then go deep enough under water to allow water to enter the snorkel tube. Once you resurface, exhale quickly. This will expel water out both the top of the tube and through the purge valve at the same time. It's important to give the snorkel a rinse with clean, fresh water after each swim. If it's used regularly, then about once a month submerge the snorkel in hot soapy water with a few drops of bleach, and then rinse with fresh water. It's also safe to run the snorkel through a wash cycle on the top rack of the dishwasher (without the head bracket). The purge valve needs to be clear of debris to do its job efficiently. The video below shows how to clean the purge valve. This is cleaned using water only. 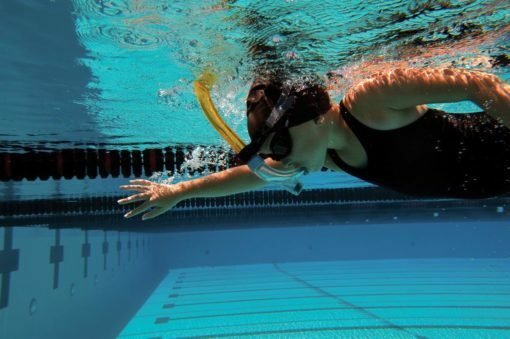 Swim snorkels are designed to build lung endurance and allow swimmers to focus on their stroke technique. Thankfully, these are a relatively inexpensive tool. Here are the 4 most popular center mount snorkels for swimmers. FINIS co-founders John Mix and Olympic butterfly champion Pablo Morales developed the first center-mounted snorkel for swimmers in 1994. It would take some time for them to catch on, but once they did, they did so with gusto. 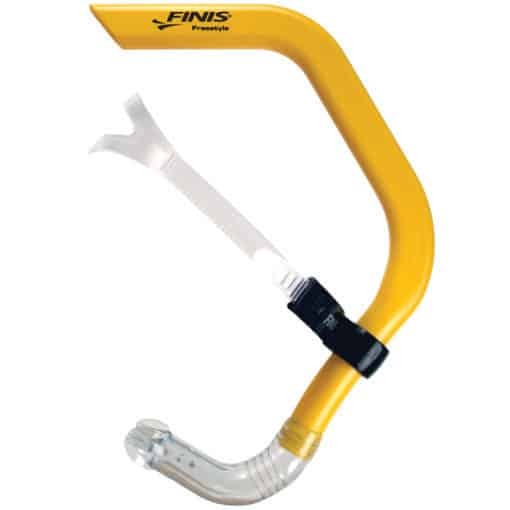 By far the most popular swimming snorkel used by competition swimmers is the Finis brand of snorkel. 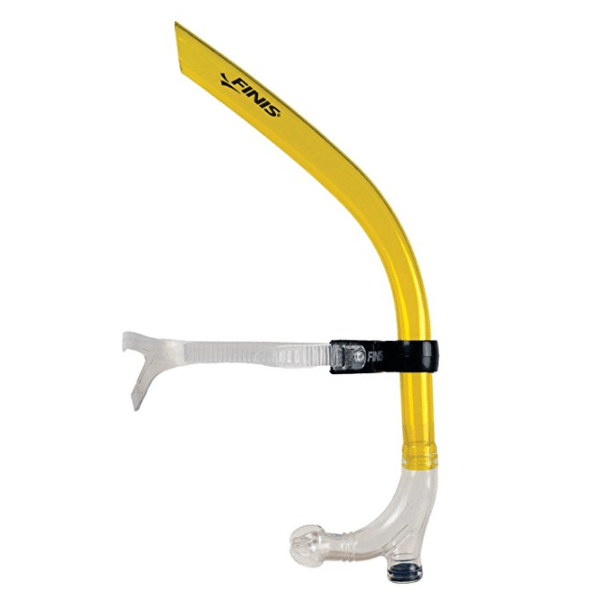 Finis have a few snorkels but the most popular in their range are their original style Swimmer's Snorkel, the Swimmer's Junior, and the Freestyle Snorkel. 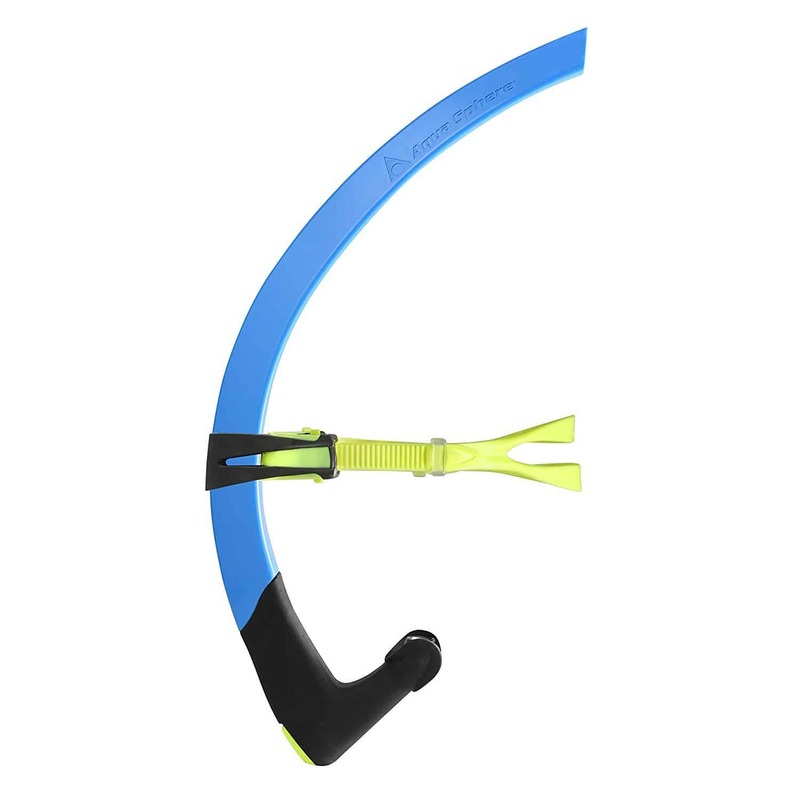 The Freestyle Snorkel features a curved shape designed for freestyle swimmers. The top of the tube faces backwards instead of straight up. This is a technique-driven snorkel that reinforces correct head alignment and will dip below the water level when out of alignment. With reinforced stability, the Freestyle Snorkel allows for full range of motion at all speeds, including flip turns. This snorkel is recommended for experienced adult freestyle swimmers. It doesn't come with a nose clip and doesn't have a purge valve. The Finis Original Swimmers snorkel is for beginners, intermediate and advanced swimmers. 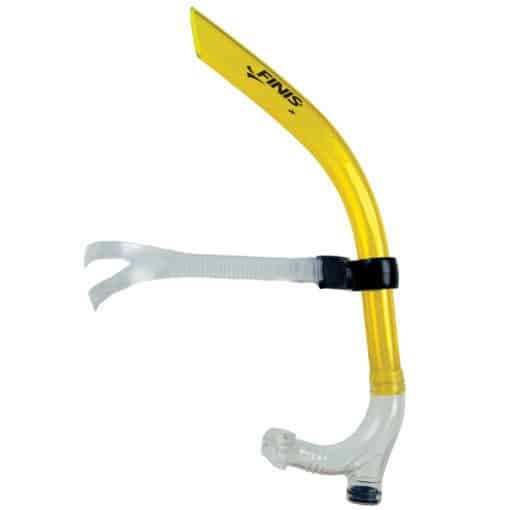 This snorkel can be used for Butterfly, Breaststroke and Freestyle. It has a purge valve but doesn't comes with a nose clip. 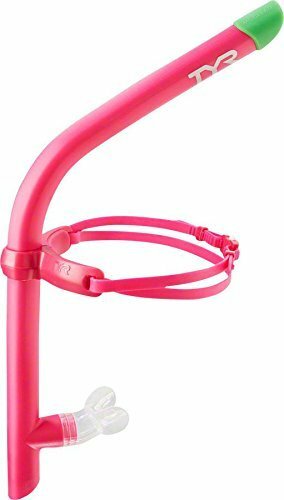 This is an adult size snorkel and can be used by men, women and teens. Petite women may prefer the Finis Swimmer's Junior snorkel. The Finis Original Swimmers snorkel is for beginners, children aged between 8 and 12, and petite women. This snorkel is 2 inches shorter than the Swimmers Original snorkel. It will stay in place for all competitive strokes and flip turns. 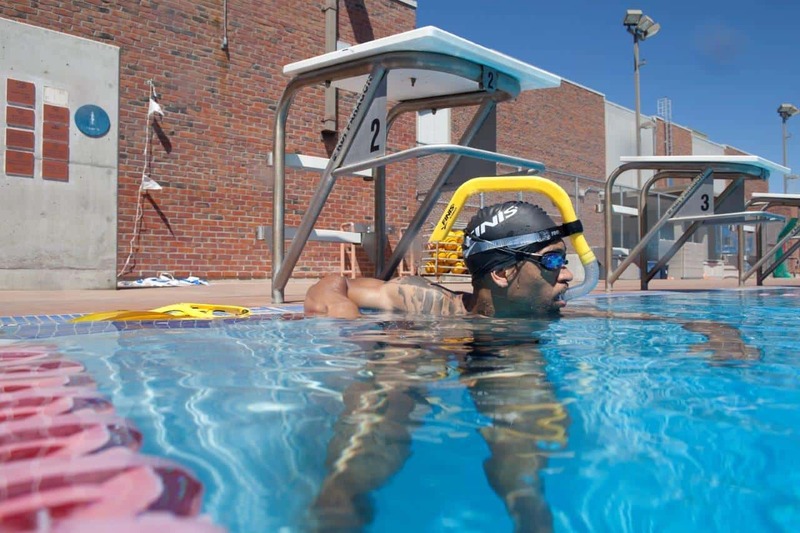 This snorkel helps swimmers concentrate on the basics such as floating, pulling and kicking. It has a purge valve and comes with a nose clip. 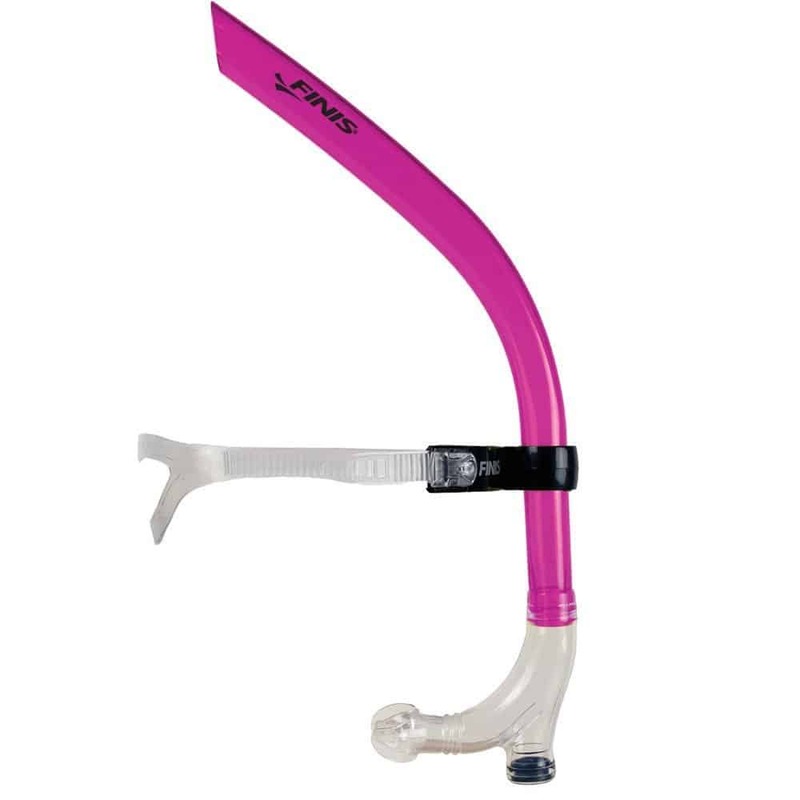 The TYR Ultra-Lite Snorkel is designed for adult swimmers and comes in either black or pink. These are super light weight swimming snorkels and have a one-way purge valve. These come with 2 restrictor caps (moderate and advanced sizes), or can be used without a cap for maximum air flow. With hypoallergenic Dura-Fit Silicone padding, the Ultra-Lite Snorkel gives a comfortable, watertight seal and keeps its shape over time. 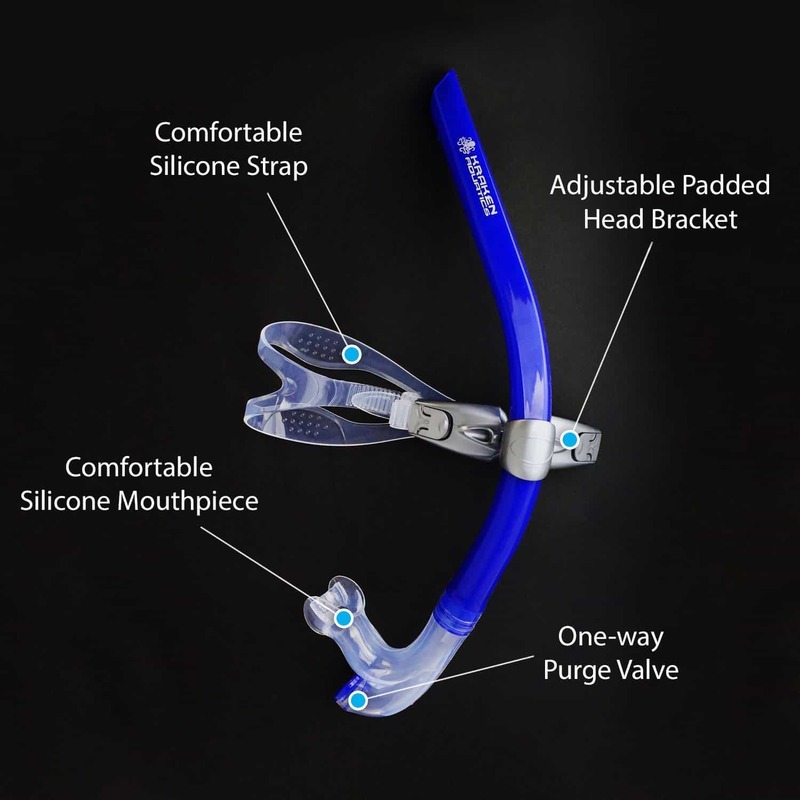 The head strap is tightened on the back of the head, unlike the other snorkels whose straps are adjusted where the headpiece meets the snorkel tube. MP Micheal Phelps Focus swimming snorkel as a unique low profile, hydrodynamic tube. The shape of the tube is triangular and the part of the snorkel that rests against your head is flat, so there's less side-to-side rotation as you swim. The snorkel also wraps tightly around the head helping to keep it in place when swimming at speed or doing flip-turns. This was something that Phelps’ coach Bob Bowman noted as a problem when Phelps used snorkels produced by other swim companies. The Focus snorkel has a purge valve and comes in two different sizes (a Regular and a Small fit) in a choice of 6 different colors. Kraken swimming snorkels works well enough but there have been complaints about the screw that attaches to head strap falling out. Some people have replaced the screw, lock washer and nut and never had another problem with it. Others report that they tightened the screw when they first got the snorkel, then again a few days later, and again never had an issue. This is something to be aware of even though many people have never had an issue with the screw falling out. The Kraken Aquatics swimming snorkel comes in one adult size, and has a purge valve. With reinforced stability, the Freestyle Snorkel allows for full range of motion at all speeds, including flip turns. This snorkel is recommended for experienced adult freestyle swimmers. It doesn't comes with a nose clip and doesn't have a purge valve. The PowerBreather range has been developed to encourage lap and endurance swimmers to really stretch their limits and exceed their own expectations in the pool, lakes or oceans. These come in 5 models to cover different swimming environments and can be worn with either swimming goggles or a face mask. It's the Ameo Fresh Air System that sets the PowerBreather apart. 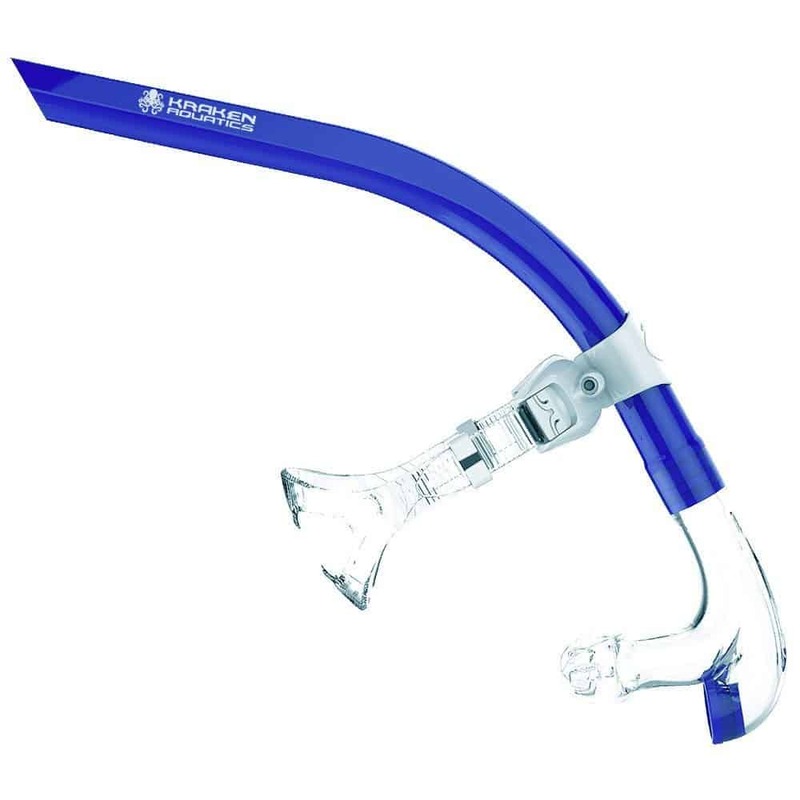 This is a symmetrical snorkel that has a 2-way smart-valve system that separates exhalation and inhalation. Fresh air is drawn in from the top tubes and exhaled through the mouth vent completely separating O2 and CO2. This design prevents pendulum breathing, and avoids undesirable CO2 accumulation or performance drop. The design also prevents water and saliva from being inhaled. Snorkel use has recently exploded among competitive and recreational swimmers. 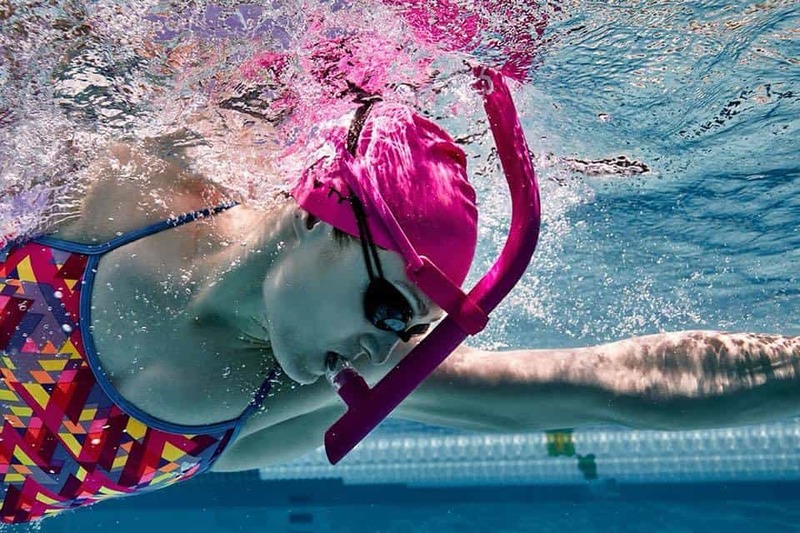 Center-mounted swimming snorkels are improving techniques and swim times of endurance and competitive swimmers, as well as recreational swimmers. With and without purge valves, there are snorkels suited to freestyle, butterfly, & breaststroke.